The beef cheek bourguignon from Central Food. Menu says: "Lobster corn dogs served with lemon and tobiko aioli." We say: There's really no meat that shouldn't be made into corn dog form — even lobster. This high-culture-meets-county-fair creation will get you ready for the rest of Beverly's awesome menu. Menu says: "Enjoy a flight of Baker's, Booker's, Basil Hayden's and Knob Creek small batch creations." We say: Legends of Fire is taking a different approach with Restaurant Week, offering bourbon, a cigar and an appetizer on their menu. This flight of four aged bourbons seems like a perfect way to start off your night out at Northern Quest Resort & Casino. Menu says: "Pig tongue, head cheese, mustard and plum braise sauce, frisée salad." We say: This is far and away one of the most adventurous first courses to be found on any Restaurant Week menu. The pig tongue is an outlier, but so is the head cheese, which is not cheese at all, but rather a meat dish made from the flesh of a pig (or calf's) head. Menu says: "Five-hour red wine-braised Wood Ranch beef cheeks, Olsen Farm purple Viking potatoes and celery root." 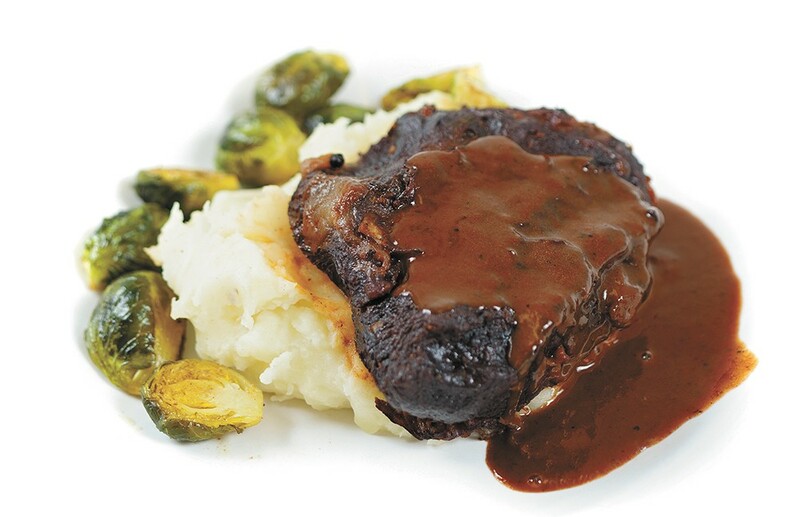 We say: Beef bourguignon is normally made with a tough chunk of meat, and cheek is as tough as it comes. Slow-cooked for hours, the cut becomes tender and full of flavor. Menu says: "Hand-formed ground elk broiled to medium with gorgonzola, diced Canadian bacon, sautéed mushrooms, arugula, garlic aioli on a house-baked sesame brioche bun with Asiago fries." We say: Aside from the fact that this features half a pound of elk, just look at all the fixings, like Canadian bacon. A good burger deserves your attention — and this looks like a good burger. Menu says: "Italian sausage-stuffed quail, blue cheese white grits, sautéed greens and Champagne vinaigrette." We say: You're most likely not going to prepare quail at home. Live a little and let Scratch do the hard work for you. Menu says: "Niko's homemade Greek quiche recipe. Savory feta cheese, fresh spinach, eggs and spices in thin, delectable layers of filo dough with beans. A vegetarian delight." We say: Don't let the term "quiche" mislead you; spanakopita is far superior to egg pie. It's more of a crispy lasagna. Menu says: "Winter chanterelle mushrooms, fontina cheese, truffle scented cream." We say: In case you didn't know, arancini are crispy rice balls filled with goodies. In this case, they include chanterelle mushrooms, cheese and more. A good opportunity for even vegetarians to indulge. Menu says: "Yucatan pumpkin seed-sauced enchiladas stuffed with fire-roasted vegetables and tipsy black beans. It's also gluten free." We say: Even the most lackluster enchiladas are still good. But it's the "tipsy black beans" that caught our attention. The Ultimate Stack from Charley's Grill and Spirits places meat loaf and mac and cheese on the same plate. Menu says: "A creative blend. 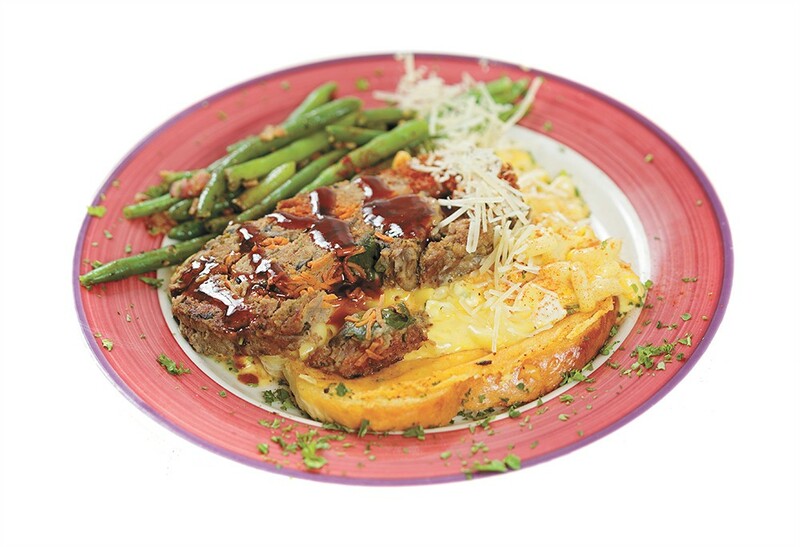 Our five-cheese mac and cheese stacked on Parmesan toast topped with our stuffed meat loaf and drizzled with sweet chili sauce. Served with sautéed seasonal vegetables." We say: We wish we were eating this right now, not merely writing about it. Mac and cheese and meatloaf on the same plate? We figured there was a law prohibiting such culinary congress. Menu says: "Braised lamb with our fresh-made goat cheese gnocchi tossed with arugula and Parmesan." We say: Gnocchi are soft pillows of goodness given to us from on high. Pair these cheesy dumplings with succulent lamb and you have the ultimate explosion of flavor. Menu says: "Home-style fried chicken atop a corn muffin waffle drizzled with our sweet-and-savory chicken sauce." We say: If you've never ventured to the South, this combination will seem odd, but give it a try — fried chicken and waffles make for an tasty hearty-meets-sweet dish. Menu says: "Wild caught shrimp, Mills Farm cheddar grits, house Tasso ham and Josper roasted vegetables." We say: The soul food staple is not for those looking to diet. But for folks in the mood to surpass their calorie count, this take on shrimp and grits with its cheesy, hammy deliciousness is where it's at. Menu says: "Pine nut and panko-crusted wild Alaskan halibut, port wine reduction, mango salsa, forbidden rice in coconut milk." We say: Doused in wine and topped with zesty tropical fruit, each flaky bite might transport you back to a warmer time in your life. Menu says: "Clams steamed in a lager broth with red onions, capers, chili flakes and garlic. Comes with a side of bread." We say: Like hanging out with a drunken friend on their birthday, you won't want to miss the experience. The dish comes with a slice of bread to soak up all the salty broth. 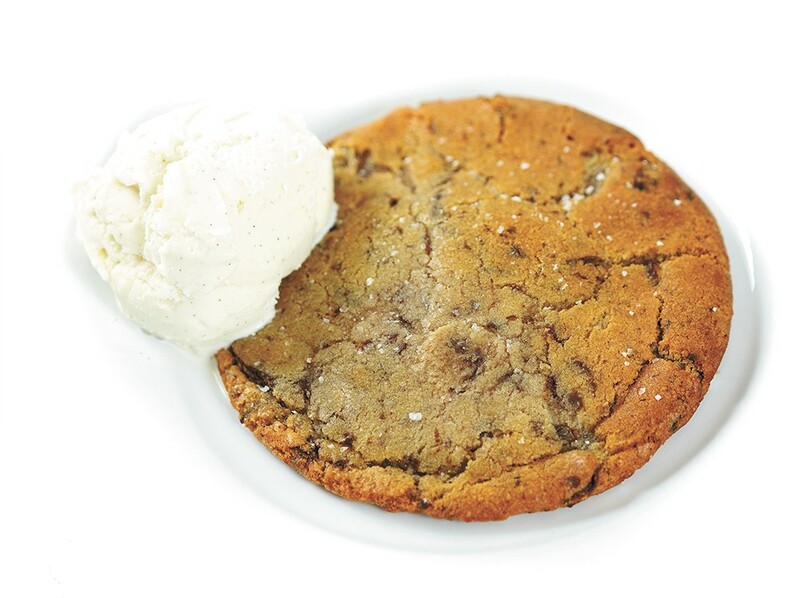 A bittersweet chocolate chip cookie from Fire Artisan Pizza. Menu says: "Finished with sea salt and vanilla ice cream." We say: If you're not hip to this salted dessert fad, get hip, because it's delicious. Menu says: "River City's Vanilla Bourbon Stout, sugar, semi-sweet chocolate, whole milk and fresh cream. Garnished with an espresso brown sugar cookie and whipped cream." We say: So heavenly we want to fill up a bathtub with this and swim in it. Menu says: "Choice of chocolate, huckleberry or vanilla."